(1) ISSUES IN SFF REVIEWING. Several interesting threads about reviews and reviewing in sff. Each tweet is the jumping off point for the thread. Here is a short thread explaining why. I have both positive and negative reviews and also a lot of "well I liked this but X aspect was annoying"
Positivity in reviewing is…a complex and sometimes messy thing. I've written about it previously, but it's always something to revisit. Not link-tweeting anyone because it's so pervasive, but: when you create a critical culture in which any negative critique is framed as an "attack on authors," you create conditions in which virtually the only people willing to do it are also willing to *actually* attack authors. Also, Jason Sanford did an overview which includes numerous links to reviewers. (2) WORLD FANTASY AWARDS. John Joseph Adams advises that the 2018 World Fantasy Awards nominations have opened and voting continues until May 31. The World Fantasy Awards will be presented in Baltimore, MD during the World Fantasy Convention (Nov. 1-4). Deadline for nominating is and ballots must be received by May 31, 2018. All registered members of the 2016 World Fantasy Convention, the 2017 World Fantasy Convention, and the 2018 event in Baltimore will be eligible to vote before the deadline. If you didn’t attend one of the previously mentioned World Fantasy conventions, and you don’t plan to attend this year, you can still nominate by purchasing a supporting membership. Already registered? Go and nominate your favorite works! Voting information is available on the World Fantasy Convention 2018 website. Previously lost footage of Batman star Adam West teaching road safety will be screened for the first time in more than 50 years. The clip from May 1967 of Batman teaching children the Kerb Drill will be shown to an audience of TV professionals and enthusiasts in Birmingham to kick-off a hunt for 100 missing television clips. Kaleidoscope, which specialises in finding missing television footage, recently discovered the segment, which was never screened outside of the UK. It will be shown at Birmingham City University on Saturday, as the company launches its list of the UK’s top 100 missing TV shows that industry professionals most want to see recovered. This includes early episodes of Doctor Who featuring Mark Eden as Marco Polo, Top Of The Pops and The Avengers. (5) UTAH WESTERCON NEWS. Westercon 72 (July 4-7th, 2019 in Layton, Utah) has added Special Guest Eric Flint. Westercon also will host the 2019 1632 Minicon. Eric Flint’s writing career began with the science fiction novel Mother of Demons. His alternate history novel 1632 has led to a long-running series with over thirty novels and anthologies in print. He’s also written many other science fiction and fantasy novels. He resides in northwest Indiana with his wife Lucille. (6) DISNEY PIXAR. A fresh trailer for Incredibles 2. 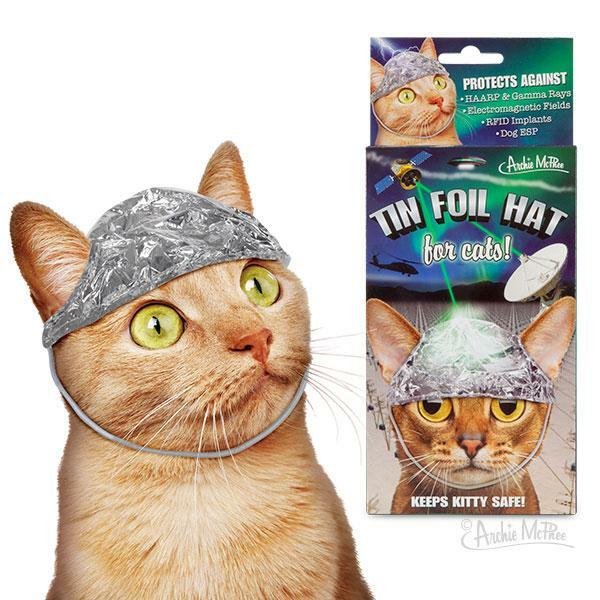 It’s a tin foil hat for conspiracy cats! They want to know what your cat is thinking. They want to control your cat’s thoughts. Not on our watch! We’ve made a Tin Foil Hat for Cats to make sure that kitty’s thoughts stay private. This mylar hat fits most cats, has a comfy felt lining and is held in place with an elastic strap. It even has holes for cat ears! Take that, Illuminati! Restores the dignity of your kitty. Very effective against MKUltra satellites, cat food company dream-insertion marketing, Guy Fieri, Soviet cat control protocols, psychic dogs, skull tapping, focused magnetic pulse and the neighbor’s labradoodle. Great for pictures! Fits most cats. (9) TOWFIK OBIT. 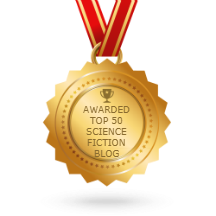 Sindbad Sci-Fi eulogizes an influential Egyptian sf writer: “Remembering Ahmed Khaled Towfik (1962 – 2018)”. Ahmed Khaled Towfik is no longer with us. After a period of prolonged illness, he died of a heart attack on 2 April 2018 in El-Demerdash hospital, Cairo, at the age of 55. By day, Dr Ahmed Khaled Towfik practised as a medical professor at Egypt’s Tanta University. Over time, he was an obsessively prolific writer who became the Arab world’s most prominent bestselling contemporary author of Sci-Fi, fantasy and horror genres. He is claimed to have written over 500 titles of which one third is science fiction, including his Arabic translations of English Sci-Fi. April 14, 1936 – Arlene Martel. She played Spock’s betrothed, co-starred with Robert Culp in the Outer Limits Demon with a Glass Hand written by Harlan Ellison plus a couple of Twilight Zone episodes. (11) SWIRSKY CELEBRATED. Steven H Silver shares his appreciation in “Birthday Reviews: Rachel Swirsky’s ‘The Monster’s Million Faces’” at Black Gate. Rachel Swirsky was born on April 14, 1982. To this point, her writing career has been focused on short stories, although in 2010 she co-edited the anthology People of the Book: A Decade of Jewish Science Fiction and Fantasy with Sean Wallace. Her stories have been collected in two volumes, Through the Drowsy Dark and How the World Became Quiet: Myths of the Past, Present, and Future. (13) GOOD TO THE LAST DROP. Charles Payseur tests a new batch of short fiction: “Quick Sips – Strange Horizons 04/02/2018 & 04/09/2018”. The short SFF from the first two weeks of April’s Strange Horizons looks at faith and education, memory and time, fiction and hope. The stories feature characters either revisiting their pasts or desperate to do so. They also feature relationships between parents and children, though in opposite directions (one with a mother as main character, the other with a son). And they explore memory and trying to rewrite the past with something better than the crushing weight of the present. 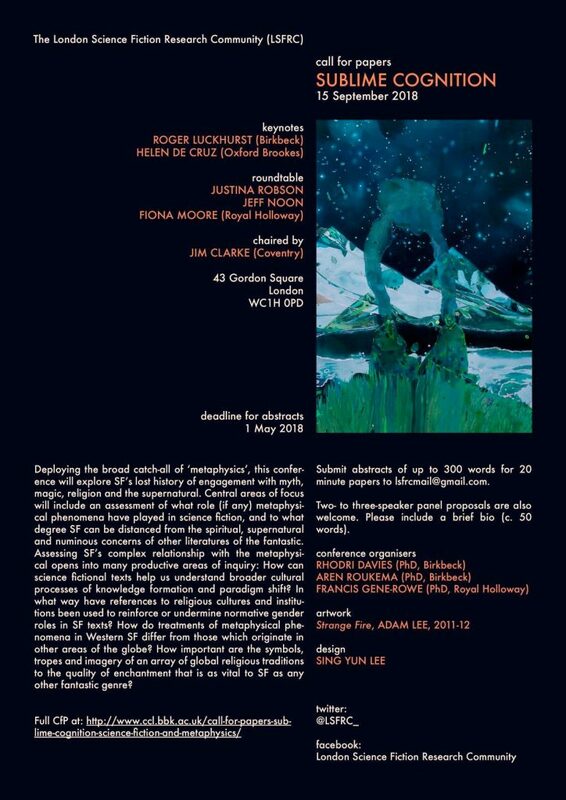 The poetry looks at religion and education, at expectation and death. It’s a rather complex collection of pieces, but it makes for some compelling reading. So let’s get to the reviews! (14) ARE YOU KIDDING? The Deseret News reports “Former FBI director James Comey is a fan of Utah author Brandon Sanderson”. When asked what books readers would be surprised to find on his shelf, Comey answered with “The Fault in Our Stars,” by John Green; the Mistborn series, by Brandon Sanderson, and the Red Rising series, by Pierce Brown. (15) SFF HISTORY. Tom De Haven remembers what it was like to write for Byron Preiss in a memoir at Café Pinfold. …I met Byron Preiss in the 1970s, near the start of both our careers—as I recall, it was at an art show that he’d curated in a small Manhattan gallery (somewhere up near Bloomingdale’s, I believe) that consisted of super-realistic, high-key paintings of Brian Wilson and the Beach Boys (yes, the Beach Boys; don’t ask me why, although probably it was the first or second or third step in a scheme to produce a “Byron Preiss Book” sometime in the future). He was the most confident man I’d ever met. Soft spoken, slow moving, but confident as hell. Always well dressed. Good clothes but they could get rumpled looking. For as long as I knew and saw him, and it was quite a while, Byron always had a hundred ideas for new projects and the sublime confidence they’d all make millions. For me, and no doubt for many other “midlist” authors like me, it was often a lifesaver to get a telephone call from Byron Preiss; he took a big cut of any advance, naturally, and the advances were never better than just okay, but when you were in-between books and fresh out of ideas, or in-between advances for novels of your own, or had a major house repair that you couldn’t afford, or there was a new baby on the way, you were glad—at least I was glad—for an offer from Byron…. (16) WILL ROBINSON REBOOTY. NPR’s Glen Weldon goes back and forth in “Will Robinson, Meet Danger; Danger, Will Robinson: The ‘Lost In Space’ Reboot”, props for competent women, points off for repetition. The original Lost in Space, which ran on network television from 1965 to 1968, began as a straightforward, if high-concept, adventure show: A colony spaceship carrying a nuclear family, a dashing pilot and a sniveling doctor got stranded on a remote planet. They had adventures while wearing v-neck sweaters over their turtlenecks, presumably because Irwin Allen, who produced the show, imagined that the future would be a chilly place. Or maybe he got a deal on velour, who knows. Over the course of its run, the focus of the show shifted from the family to that weaselly doctor. Looking back, it’s easy to see why: The family was a bunch of white-bread squares in matchy-matchy outfits, but the doctor – played with a sublimely mincing menace by Jonathan Harris, was a revelation. The character of Doctor Smith was vain, overdramatic (“Oh, the pain, the pain!”), selfish, self-pitying, self-aggrandizing – a campy, eminently hissable villain out of a Christmas panto, down to the clipped British accent (which was something the Bronx-born Harris sniffily affected). (17) LOST ATTENTION. In contrast, the Boston Globe reviewer describes the robot and the series as “sleek, shiny, and boring”: “‘Lost in Space,’ we have a problem” (may be passworded soon). The casting is a problem, except in one case — Parker Posey as Dr. Smith. Molly Parker, a favorite of mine from “Deadwood” and “Swingtown,” is OK as the logic-and-science-loving Maureen — but she can be so much better than OK. The writers try to give her a personal storyline, since she and husband John, played sternly by Toby Stephens, are dealing with a troubled marriage. But it’s hard to care about the fate of their relationship because they’re so bland and heroic. The rest of the Robinsons are bland too, with Will (Maxwell Jenkins) a sweet but dramatically inert presence. I didn’t worry about their safety during all of their dangerous missions because I just didn’t care enough about them. TV’s original Robinson family wasn’t particularly exciting, either, but at least whimpering Jonathan Harris’s Dr. Smith brought enough camp and cowardice to keep things entertaining. This year, inevitably, my decision-making process is going to be more focused and more self-conscious, so I’ve laid out a few ground rules for myself. First, I have tried to avoid seeing what the other jurors are choosing, so this selection process has been conducted in isolation. Second, my Shadow Clarke to-read list isn’t going to feature anything I’ve already read, although there are some titles there I’d dearly like to discuss with the other jurors: Nick Harkaway’s Gnomon, for example, which is very much my kind of novel – formally inventive, a challenging read, a great story. But Gnomon is among a handful of titles already touted as shoo-ins for the official Clarke shortlist, and I have also decided to avoid putting any of those on my to-read list. I’m going to read them anyway and at this stage I’d rather experiment in my reading and see what’s going on in sf. This may seem very perverse but I would remind you that this exercise is categorically not about attempting to second-guess the official shortlist. As such I have leeway to explore. With those decisions made, things become both easier and more complicated. Critics and reviewers are mortals like the rest of the world, and we all have our prejudices. For example, as I’ve noted before, I dislike zombie novels and while I could test that prejudice by reading a zombie novel – there seems to be a prime candidate on the list – I’ve come to the conclusion that I am secure enough in my understanding of my active dislikes to avoid wasting everyone’s time by confronting them, because the chances of anything positive emerging from the encounter are unlikely.